Indian Diamond Jewelry design has become increasingly popular in the last decade due to a move from classic designs to contemporary jewelry. With the Indian fashion moving towards Western taste and incorporating minimalism in design, Indian diamond jewelry designs have taken the lead in complementing this trend. The main reason is that Indian diamond jewelry can be worn with multiple outfits as it is a neutral stone which complements different hues prevalent in the Indian outfits. In order to replace the heavy gold jewelry that is traditionally worn across India, this shimmering and valuable gemstone is used to create lighter and more contemporary pieces. The reason why Indian diamond jewelry designs are simpler and lighter is mainly because the sparkling gemstones catch your eye from a distance. This means that you really don’t need a very thick necklace or huge earrings to bring out the beauty of design. The sparkle and glamour of diamonds has been coveted by both men and women for centuries and many a war has been fought over this prized gemstone. For this reason many unique diamond jewelry designs have become popular all over the world. Indian diamond jewelry designs showcase floral and symmetric patterns in the most beautiful manner. Each diamond is set properly in a gold or silver or perhaps platinum-base and the idea is for the jewelry piece to bring up the beauty of the diamond rather than lose it in design. Diamond necklaces have been popular for centuries and especially in the Mogul times. In these days gold and silver were used as base metals to wear around and show off the beauty of diamonds. However, they are not extremely popular in terms of investments because diamonds can be sold back only to the jeweler you purchase them from. The resale value depends on the current market availability and overall global value. Diamonds are extremely versatile in the sense that they can be worn with any outfit and styles. 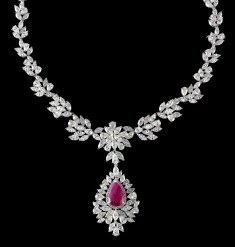 This means that Indian diamond jewelry even in the contemporary or classic form may be popular across the world with both locals and Westerners. From stunning rose cut local diamond to imported South African diamond, Indian diamond jewelry is popular all over the world. Not only is it used to create heavy jewelry for brides and wedding use but you can get necklaces, rings, earrings and even pendants that can be worn independently for a minimalist but classy look. Indian diamond jewelry designs are created from refined gold and silver metal which allows jewelers to mould the design to a perfect finish. It is possible to create bespoke Indian diamond jewelry designs. These are customized according to the color requirement, shape and size demanded by the client. You can create Indian diamond jewelry in traditional and classic designs in which the pale colored hues of semi precious stones are matched with the sparkle and brilliance of diamonds. Ethnic touches can be amalgamated with urban chic to create unique pieces which are one off and not replicated for the clients. The excellent skill and craftsmanship of Indian diamond jewelry design has made it valuable the world over. The trend of Indian diamond design and its economic importance is visible especially in areas where gold and diamond jewelry is extremely popular. The Middle East is known as a center of gold and diamond trade for finished jewelry pieces. It is interesting to note that 80% or more of the jewelry available in these gold centers originates from India.